Zach and Whitney Bates tied the knot in December 2013, while Michael and Brandon Keilen got married in August 2015. In the video below, the two couples discuss their dating relationships and how they grew closer together before becoming husband and wife. Lily Ellie if are interested in being very close friends or possibly getting married what does warden look for? Or Jackson look for? Um, I think they're a little young to be getting married. The Bates need to make a DVD of all the Bates weddings. None of these videos work. They all get stuck on the Cracker Barrel Ad before and never move. I really like watching Michael and Brandon. Favorite couple! Since none of them have ever 'dated', why are they giving advice on something they've never experienced. Courting is not dating for they have never been alone together before marriage. True -- they make a point of telling us that courting is not dating. Courting is still dating, but just with the purpose of marriage being the main goal. Your looking for a spose to marry. So you're not just dating to date for fun, or being with multiple people sleeping around,or wasting time. Its dating with a purpose to find a mate to marry. Regardless of whether they dated or not, the advice they gave is spot on. 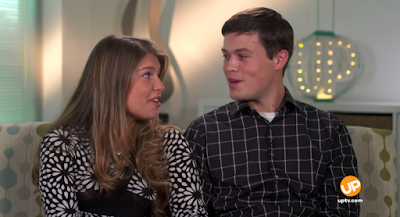 Lawson Bates and Jana Duggar Courting?